Rhubarb is in season right now, so catch it while you can. 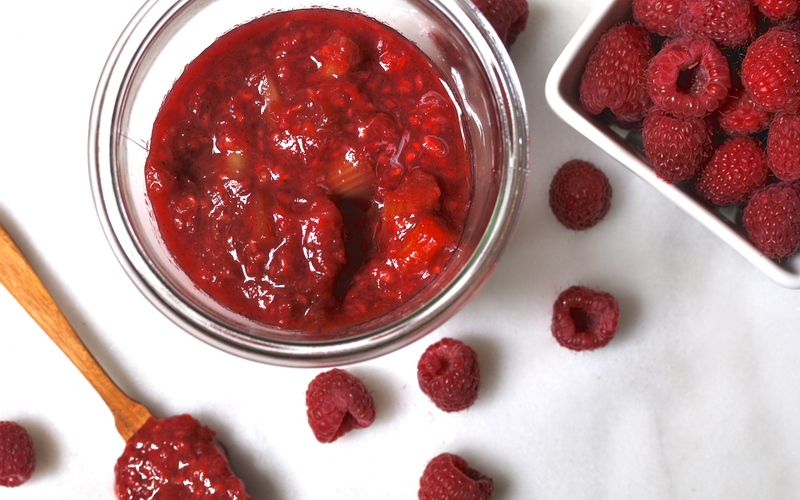 Instead of making the usual suspects (pie and crisp), why not try this simple, delicious, sweet-tart compote? It can be spooned over ice cream, big meringues with whipped cream, pudding or pound cake, or swirled into your morning yogurt if you’re feeling virtuous. I’m having a friend for lunch tomorrow and plan on serving it over panna cotta that’s chilling as I write this. I’d planned on making something else for dessert, but abandoned those plans as soon as I spotted those crisp, rosy stalks at Elawa Farm’s garden market this morning. Cut bean in half width-wise and save other half for another use. Cut bean-half length-wise and scrape seeds out by running knife along length of pod. Place chopped rhubarb, raspberries, vanilla bean seeds and the pod you just scraped them from, lemon zest, sugar and water in a medium saucepan. Stir. Bring mixture to a boil over medium-high heat. Reduce heat and simmer 6 to 8 minutes, stirring frequently, until rhubarb has softened. Using the back of a wooden spoon, smash some of the softened rhubarb pieces and stir to distribute. Turn off heat and stir in the lemon juice. Remove vanilla bean pod. Spoon warm over ice cream or allow to cool completely before storing in the refrigerator. Compote will thicken as it cools. Mmm what a great combination of flavours!